The numbers are quite daunting. Over 1.2 million people in India need eye surgery because of various corneal diseases, and 25,000 people are added to this list every year. But currently, just 42,000 eye donations happen across the country, of which only 50 per cent are found suitable for transplant. Trying to bridge this gap is Vasan Eye Care (VEC), one of Indiaa��s leading eye care specialists and a part of the 65-year-old Vasan Healthcare Group. Vasan Eye Care has long been active in promoting eye donationa��but had limited their activities to talking to corporates, NGOs and patients visiting their hospitals. Now theya��ve decided to broaden their boundaries and target the youth on Facebooka��a platform thata��s become their second home. 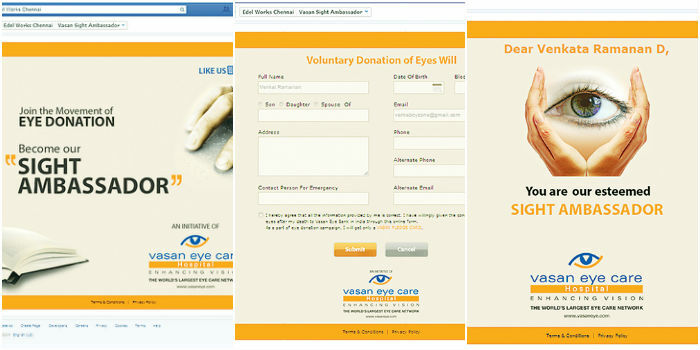 On January 21, the eye care specialistsA� launched their social media app for eye donation. According to Dr Anand Parthasarathy, medical director of Vasan Eye Care, users can visit their Facebook page, click on the app and fill in an online form. Once done, your profile is tagged as a a�?Sight Ambassadora�� and you will receive a nationally-recognised donor card. a�?At the launch of the app we received around 200 applications from the students and members of the Society of Electrical and Electronic Engineers, Anna University. Since then wea��ve seen quite a lot of interest on the page and more people registering,a�? says Parthasarathy, adding that the next step is to develop an app for the Android and iOS platforms. a�?We are looking at launching a free eye health phone app in the next three to four months. The app will not only help you become a a�?Sight Ambassadora��, but it will also give information about various eye diseases, the treatments available, and answers to questions like a�?can someone who wears glasses donate their eyesa��,a�? he concludes.